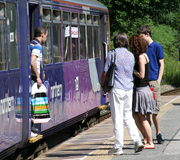 News and information about cycling in West Yorkshire’s public transport system. Train times and discount information. Purchase tickets online. Coaches and trains information and fares, airport transfers, purchase tickets online. Train times and tickets, find cheapest train fares, purchase tickets online. Journey planner, train information and resources. The Penistone Line Partnership is a voluntary organisation which supports community involvement along the Huddersfield-Sheffield railway line. To plan the quickest route for your journey. South Yorkshire travel information, tickets and passes, live bus arrival times. Public transport information, journey planner and timetable finder. Information on public transport services available in West Yorkshire. Journey planner, bus time tables and routes, live rail departure times and information about the MetroCard.